Welcome to 'Kate Trygstad', home of Creative Facilitating and Coaching and Kate Trygstad Art! Creative Facilitating and Coaching brings approaches and solutions tailored to you and your goals. Recognize what happens within, between and among people and learn to make what you do together strong, intentional and creative. Kate Trygstad Art channels the energy of scenes into a visual image that conveys emotion. Hear trees, rocks and water talking. Look at things a little differently. "Discovery Through the Ferns" received an award at the August 2018 show Power of Nature. 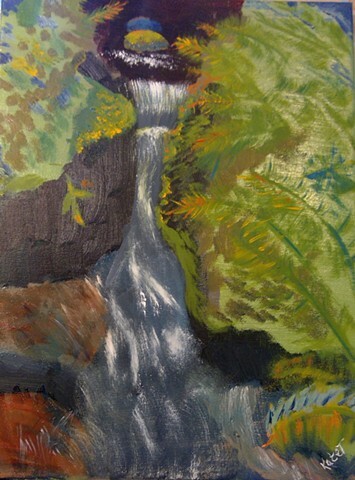 It captures the delight of chance sight of a small vista, a streamlet cascading over stones when viewed through the surrounding ferns of this mountain rain forest on Oahu, Hawaii. Nature reminds us to be delighted. We can carry that delight into human relationships as well when we are open to it.